Lupe and Brian discuss the upcoming year, self-evaluation and adjusting goals. We hope you all had an awesome Christmas this 2018. Lupe: My name is Lupe. Brian: And this is Brian. Lupe: And today we want away Christmas. Lupe: We hope everybody had a very nice holiday. Merry Christmas to everybody! Brian: And we’ve got New Year’s coming up and if you’re gonna go play… if you’re going to bring in the new year, start hydrating now. Lupe: If you can stay awake, we recommend it. Yes. Brian: We kind of watch the east coast ball drop at 9:00 our time, so we don’t even have to stay up till midnight anymore. Brian: But no, we hope you’re all enjoying a great holiday season and you’re with family and loved ones. And if you’re not just binge listen to Sjogren’s Strong. Lupe: You don’t have to spend it with family. It’s all about you. Take care of yourself. Sometimes family stresses you out. Stay home and just, you know, enjoy yourself at home. Brian: So a couple of things we want to bring up before we get into the main subject of this week’s episode, is the website. 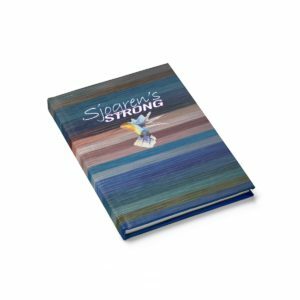 If you have not visited SjogrensStrong.com, we encourage you to do so. We put in a lot of work on making it a great place to house content. More and more content is going up weekly. Brian: Uh, let us know what you think, what you like, what you don’t like. Be sure to check out the recipes. We’re going to be adding a new recipe every week. 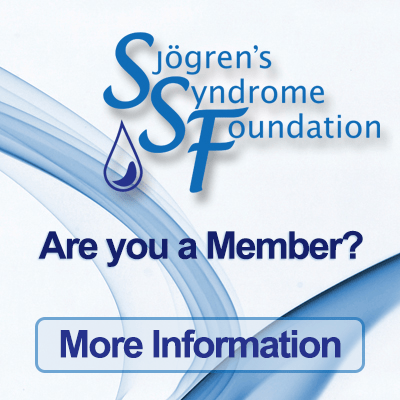 We’re putting up more and more information about Sjogren’s Syndrome, about us. Brian: Our episodes are there to include full transcripts. So if you’d like to read them or use an assistive device to consume the content you can do so there, Links to all of our social is there. Um, but we really want to make it a great place for you to come and hang out and see what we’ve got going on. Lupe: I wanted to talk about, like he said, reevaluated in self expectations. It’s okay to change your goals. If you had a goal set out for yourself that hasn’t planned out for whatever reason. You know you’re too tired, brain fog, you know, because of Sjogren’s, I know for myself, I’ve had to reevaluate myself and my goals. It’s okay to change your goals if what you had set out for yourself, it’s not working out. But be sure to replace it with a new goal. That’ll give you something to work towards and to live for, basically. Brian: In a nutshell, if you have a goal and you’re having a hard time achieving it, you really need to take a step back and evaluate the expectations you put on yourself. Is this goal achievable, but it’s just going to take a lot of hard work? That’s okay. It’s fine to have that hard work to achieve the goal. 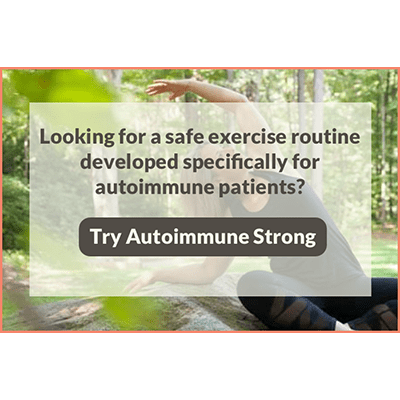 Brian: We don’t want goals lessened because it’s hard work, but if your autoimmune is a massive barrier to achieve that goal, we feel that it’s okay to set other goals. Brian: And not necessarily give up on that goal, but just put it up on the shelf for a little while and maybe you’ll feel better in a few months to where you can work towards it a little bit. And you know, a goal that say, might take you a year, might end up taking two or three years, but it’s okay as long as you’re working towards it and slash or a goal. We’re firm believers that you always have goals and you’re always working towards them. Lupe: For example, me, I love school and education and I’ve always wanted to continue my education, but for the past several years I find that I try and it’s just very stressful for me, easy subjects. And it’s very stressful for me. I can’t sleep, you know, I go to work stressed, I don’t perform well at work and then I come home and try to do homework and it’s just been really hard for me. And I took a step back and I thought, you know, what, why am I doing this to myself? Lupe: I realized that that goal wasn’t achievable for me at this time. I didn’t completely give up on it. But I used to find myself, in June, everybody’s holding up their diploma because they continued their education. And I found myself being a little envious and I got teary eyed, because that’s really something that I wanted to do. And I came to the conclusion that it’s not a goal that I need to complete right now. Speaker 1: So I moved on. But I made sure to set another goal for myself, because it gives me something to work towards, it gives me a purpose. And the new goal that I set up for myself was Sjogren’s Strong, building a community of like-minded individuals. And for me it’s been really positive. Lupe: Since the last show, where we thanked everybody for the comments and messages… and I’m kind of getting emotional right now. I’ve received several messages from a lot of people that have been recently diagnosed and they’ve called me Angel because they reach out to me with, you know, they don’t know what to do. I don’t know anything. I feel alone. Lupe: And so that’s why we created this because we, everybody to know that you’re not alone. We want somewhere where people can go to and ask for help. And so, you know, a lot of people have called me their Angel and so that is, this my new purpose in life and excuse me, I’m getting really emotional right now. But, uh, it really means a lot to me. Speaker 2: Yeah. And again, we want to thank everybody who has sent positive messages, encouragement. 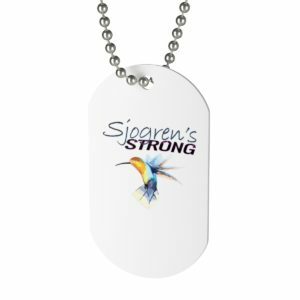 We’re building this community for you, for ourselves, to shine a positive light on Sjogren’s. Brian: And from everybody we’ve spoken with, when you get diagnosed, um, obviously there’s a funk, but we can still live an active, healthy lifestyle with Sjogren’s. And that’s what we really want to focus on. Lupe: So if you have an idea or you want to see or hear about any topic from us, let us know. Nothing’s off the table. We want to cover everything possible and eventually we will, over time. I’m sure one day we’ll be praying for some new med to hit the streets so we have something new to talk about. But we want this to really be a cool place for everybody with a positive mindset and doing everything they can to live that active, healthy lifestyle. Lupe: If you have anything you want us to talk about, discuss, please let us know. We are here to help. That’s why we’re doing this. Lupe: Look. And again, we’re not medical professionals, we’re not doctors, but we’re putting the time into research, number one. Number two, we’re building relationships to bring guests onto the show that can talk about those topics that I’m ignorant on. Um, we’ve got a couple cool episodes planned with just that. So you know, again, if there’s something you want to hear, let us know. We’re here for you. Lupe: Also, we want to remind everybody to drink, drink, drink. Stay hydrated. I don’t mean booze. I mean water. The reason I’m saying that is because I’m having a tough time staying hydrated, right now, because it’s cold. We’re in southern California, but it’s been, I dunno, 60 something and for me that’s cold. And my office is like, they keep it like it’s the North Pole. Lupe: And I haven’t been consuming enough water because I’m cold. And I don’t feel that my body needs it, but obviously it does. Because my eyes feel extra dry. 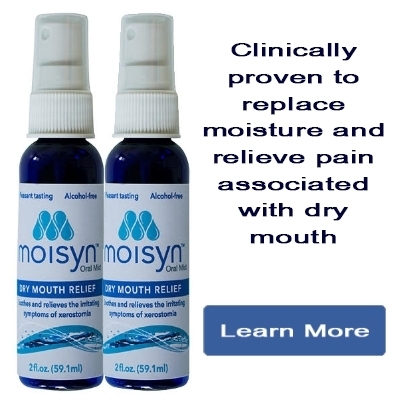 My mouth is cracked inside, it feels extra dry. So I’m trying to drink as much as I can. And Brian is really helping out with me more water when he sees that my bottle is empty. So I appreciate that. So yes, sip, sip, sip. For example, I got my ice water right here with me. Brian: So we really do appreciate everybody listening. We hope you’re, again all having a great holiday season. Lupe: Before we part. I just wanted to let everybody know that Sjogren’s and alcohol don’t mix. Rethink your drink. And drink more water. Lupe: We appreciate you listening. Be sure to follow us on Instagram, Twitter, and Facebook. Brian: And you can join us on our Facebook group, Living Sjogren’s Strong. And be sure to sign up for our newsletter. You’ll get a weekly email reminder of what’s going on on the website, what’s going on with our upcoming shows, other cool things that we come across from time to time. You can do that on Facebook and/or SjogrenStrong.com. Lupe: I don’t know if you mentioned it, but we started trying out new recipes. And those are up, as well, so I’m excited about that. Lupe: And please give us a rating and review on whatever platform you listen to. Whether it be iTunes, Google Play, iHeart Radio, Sitch Radio, Spotify, Sticher. You can also visit SjogrensStrong.com and listen and read a full transcript. Lupe: SIP CONSTANTLY AND STAY HYDRATED.